When you walk into my house one of the first things you might notice are the copious stacks of books on shelves and tables. I'm a voracious reader and one of my all-time favorite genres is "Self-Help" or personal development. This is probably because one of my core values is growth. 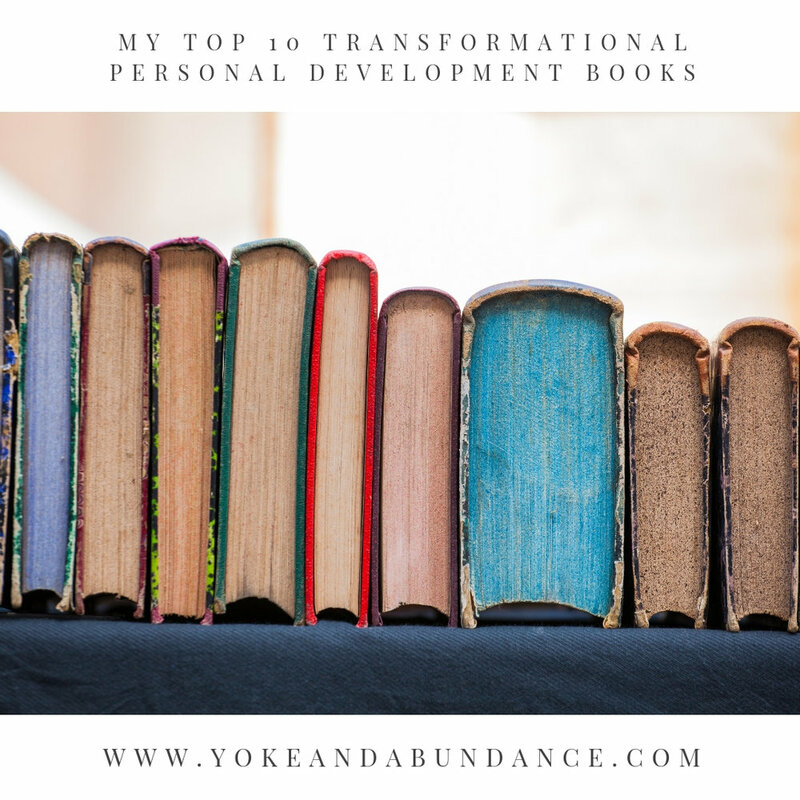 Here are my top 10 favorite personal development books. What would you add to the list? Additionally, I always advocate getting books from your local bookstore. If you're here in Greensboro, NC Scuppernong Books is fantastic! But if you're in a pinch, or not close I've attached my affiliate links to these books. 10) The Alchemist by Paulo Coelho is a hero's journey much like the one Dorothy makes in the wizard of Oz. I think we often need to learn this type of lesson the hard way. 9) Big Magic by Elizabeth Gilbert is a reminder that you are a creative being. We need this lesson, over and over again. Liz Gilbert will make you laugh, and cry and gently remind you that you need to create, in small ways and big ways, take the creative path. 8) The Universe Has Your Back: Transform Fear to Faith by Gabrielle Berstein. Gabby shares her recipe for living from a place of abundance and moving out of fear. She gives practical tips and meditations to shift your thinking and move into faith. Sometimes her tone grated on me but her message is so good I tried to ignore the tone. 7) Eating in the Light of the Moon: How Women Can Transform Their Relationship With Food Through Myths Metaphor and Storytelling by Anita A. Johnston. This book I love because I've struggled with mild disordered eating since puberty and the way Anita talks about how disordered eating is a way for us to ignore the bigger problems in our lives really struck a chord in me. This particular quote sums it up pretty well for me "If I'm obsessing about food, fat, and dieting, what I'm doing with food is distracting me from the real issues I struggle with in my life"
6) A Return to Love by Marianne Williamson. This book, helps you remember that you are strong, and "powerful beyond measure" but the thing is you have to believe it and trust. Mairanne helps connect you to the part of yourself that is all love and helps you remember how to trust that strength within yourself. 5) The Gifts of Imperfection by Brene Brown. This book taught me that if I discredit my feelings of hope and desire I discredit all of my feelings. You can't have it both ways and that's a big lesson. It's important to tell yourself and your friends and your family what your excited about, what you're hopeful about what you're dreaming of because if you don't when you don't get those things you're alone in your devestation and dissapointment, and if you do get it your joy is also diminished. 4) The Desire Map: A guide to creating goals with Soul by Danielle Laporte. This book taught me that I didn't have to jump through arbitrary hoops. This book helped me understand what I wanted and why I wanted it. 3) The Four Agreements: A Practicle Guide to Personal Freedom by Don Miguel Riz. This book is absolutely life changing and a short read. I recommend it for everyone. Even if you think you know the agreements because you've heard about the book and read about them on a poster this book is worth visiting with. I keep one in my bedside table drawer. 2) The Basics of the Law of Attraction by Ester and Jerry Hicks this book has significantly impacted how I interact with the world. It's changed the way I work, play and interact with everyone I meet. This book has changed the way I look at the world. 1) The Artist's Way: A spiritual Path to Higher Creativity by Julia Cameron. My number one recommendation to everyone who is serious about their growth is this book. This book is my personl bible. This book will help you explore yourself in a way that no other can. If you want to get in touch with your purpose, if you want to bring more meaning into your life or if you want to unfold to your own creative being this book is for you. What would you add to this list? What are the books that have been most influential in your life?